The NSK-294 adopted the latest technology from Europe. The machine can fasten soles to vamps in one step to replace the previous complicated sole-joining process-gluing and sole attaching and pressing, it can also save manpower, reduce production cost and improve your productivity. In addition, the NSK-294 only moves the ejector while the molds are fixed. Therefore, the machine is steady and has no bugs. The molds are operated by the independent lubrication system, which generates great clamping pressure and simplifies the structure of the machine. The operation and maintenance of this machine is much easier than the traditional European one. Fastening soles to vamps in one step to replace the complicated procedure of gluing, sole-attaching and pressing. 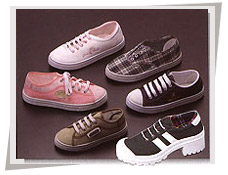 It can produce foam soles, high-transparent P.V.C., T.P.R. and PU soles so as to replace the cross ejector. The ejecting quantity is controlled by the photo-cell digital system.Two kinds of machines are available-one with eight kinds of ejection capacity and the other with twelve kinds of ejection capacity. It can join soles of sporting shoes or it can also eject whole plastic soles. After the required quantity has been ejected, the hydraulic system will automatically move the disc to another position.